Samantha Evans and Shauna Guinn travelled to America in 2012 – 2013 on a road trip of epic proportions to find out “what exactly is american BBQ?” Their mission was to attend masterclasses, listen to pearls of wisdom from backyard and competition ‘cuers’ alike and try as much BBQ as possible. Their adventures saw them help cook for a rodeo in Houston (50 briskets, 300 chickens and 500 racks of spare rib!) to helping an old mountain man repair his even older drum smoker deep in the Appalachians and being entrusted to spice rub secrets that they have to ‘take to the grave’. They attended masterclasses by competition winning barbecuers and travelled around eating the very best (and sometimes the very worst) barbecue in the world. Having experienced all the major State variations, they aim recreate authentic southern style BBQ an southern cooking using British produce. Since arriving back, Sam & Shauna, affectionately known as ‘The First Ladies of ‘Cue’ have taken the slow and low world by storm. They are credited with giving real momentum to the pop-up restaurant and street food movement in Cardiff, inspiring many others to start their own street food and drinks businesses. In 2015 they won the coveted ‘Best Street Food’ Award at the BBCR4 Food Awards, have written their first cook book released in May 2016, created Wales’ first craft Soda (Triple Soda) with Pipes Brewery in Cardiff, first in Wales to create dedicated beers that perfectly pair with their BBQ with Waen Brewery in Mid Wales and Crafty Devil of Cardiff, and if that wasn’t enough, opened their first (of many) restaurants, starting in Barry. Not bad for a 3 year old business! 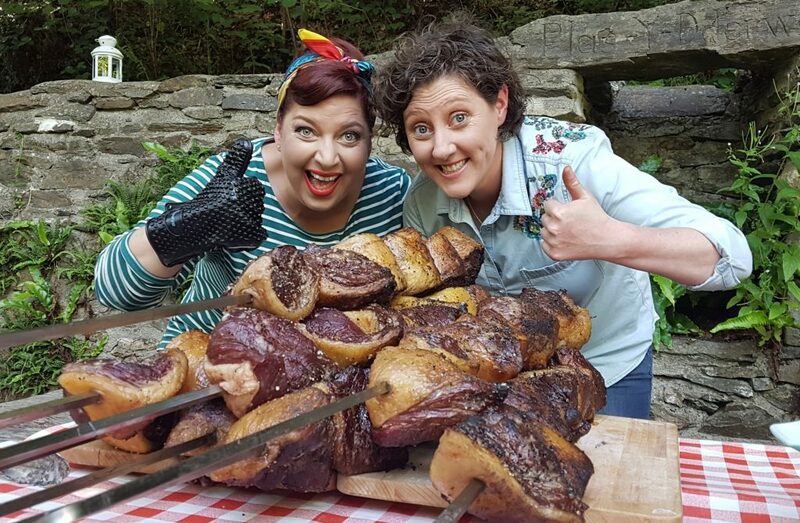 In 2018, their TV series Sam and Shauna’s Big Cookout saw the duo travel to different communities in Wales and reward the achievements of unsung heroes and organisations that go the extra mile within that community, and they’ll be back on our screens in 2019.